We got permission from the Woodland Trust to revisit this beautiful wood. 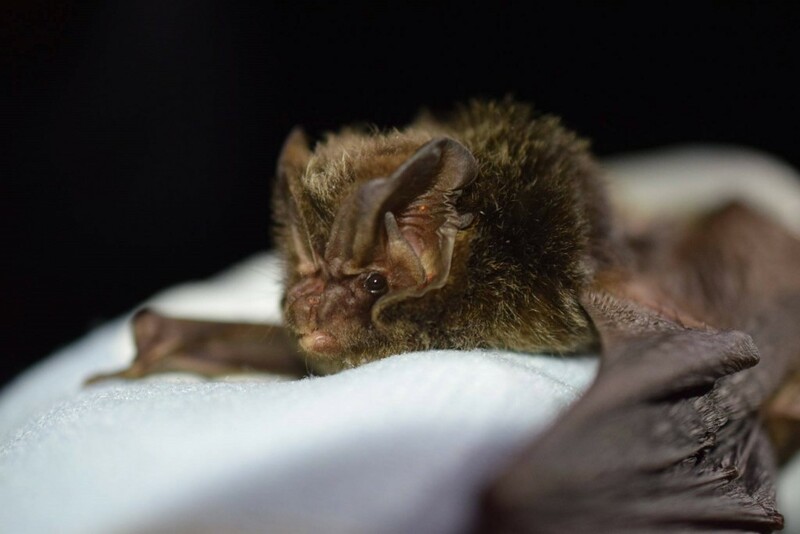 It is home to barbastelles and were joined by a visiting member of the West Yorkshire Bat Group who has longed to see one. 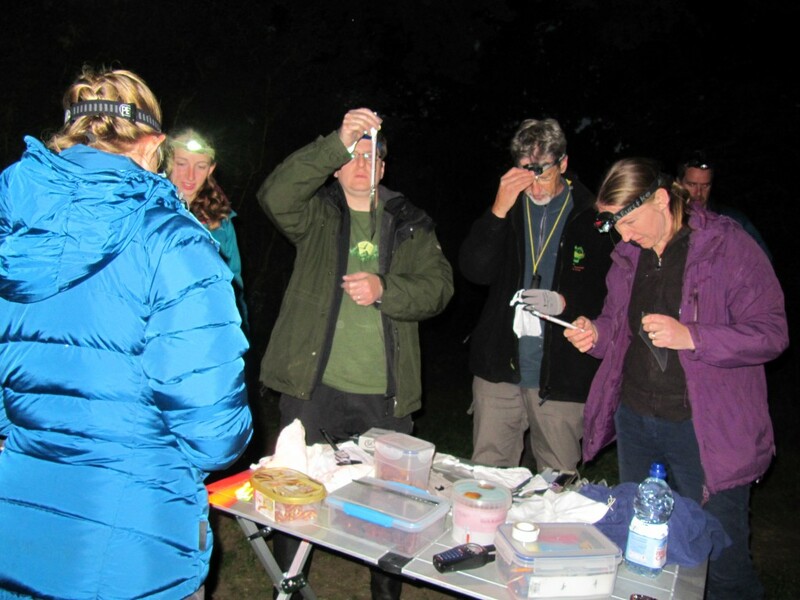 The main aim was to trap another Nathusius here and 14 of us, 3 harp traps and lures descended on the wood, with a double and single high net and waited. Fourteen of us had a really good evening with much laughter and cake eating, in depth discussion by the techies present on the pros and cons of different detectors gave way as the night wore on the conversation got increasingly surreal. Processing bats. Photo Nicky Monsey. The sharp eyed may notice the food stash. The cake had not made an appearance at this stage. 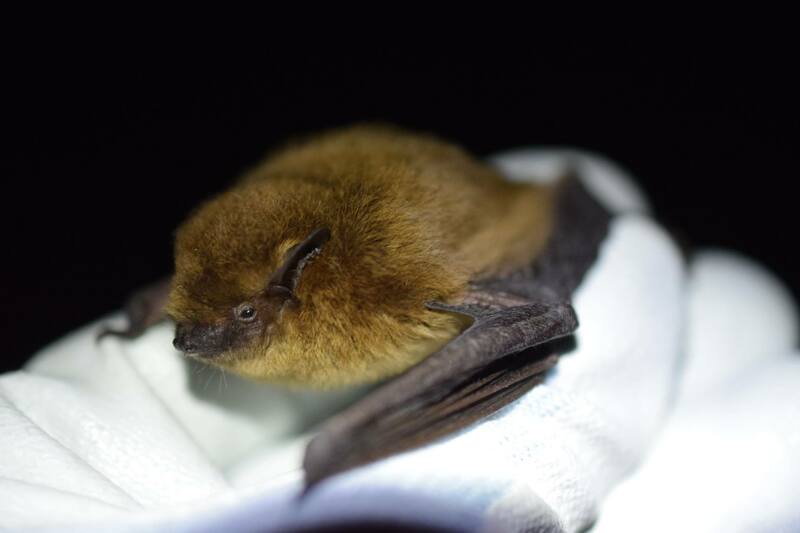 I suppose it was inevitable the Nathusius would avoid us, but we did trap our first Daubenton’s at the site. 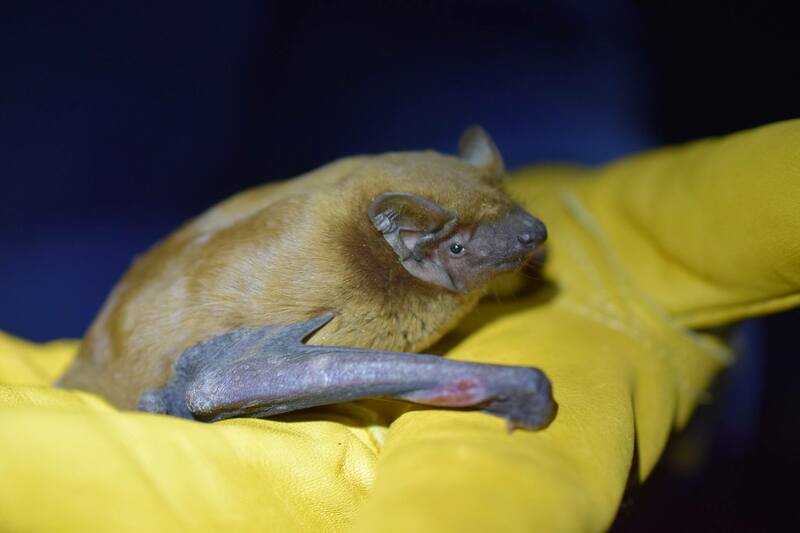 We also caught our first Noctule, who had some strange wounds but who seemed well able to fly. This male ,as Noctules do. grizzled like mad, and then was reluctant to fly off, but he eventually did so strongly. We caught a number of sopranos and common pipistrelles who were a bit better behaved. 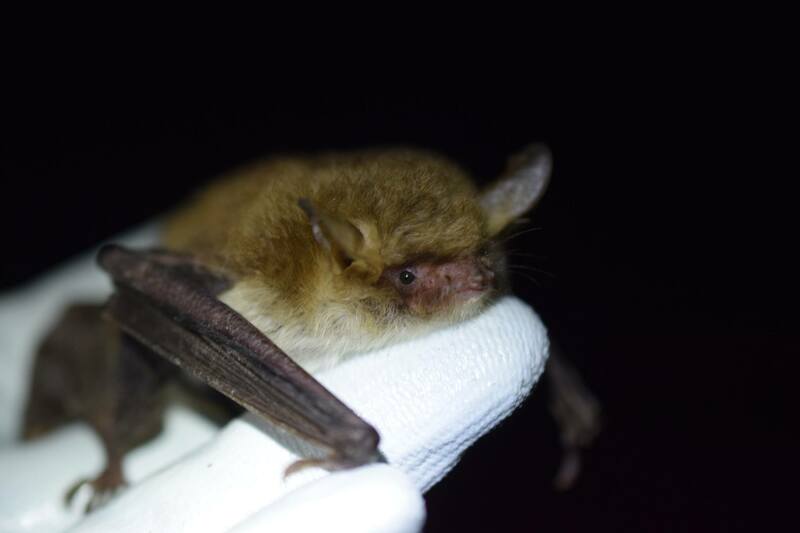 We also caught a couple of gentle Natterer’s. But the highlight of the night was a really beautiful female barbastelle, which lacked any of the ticks we usually find on them.I wish I had taken a photo of Glen’s face. That was one happy man, and several of the group got their chance to handle a barb for the first time. We left tired, cold, full of cake and very happy. 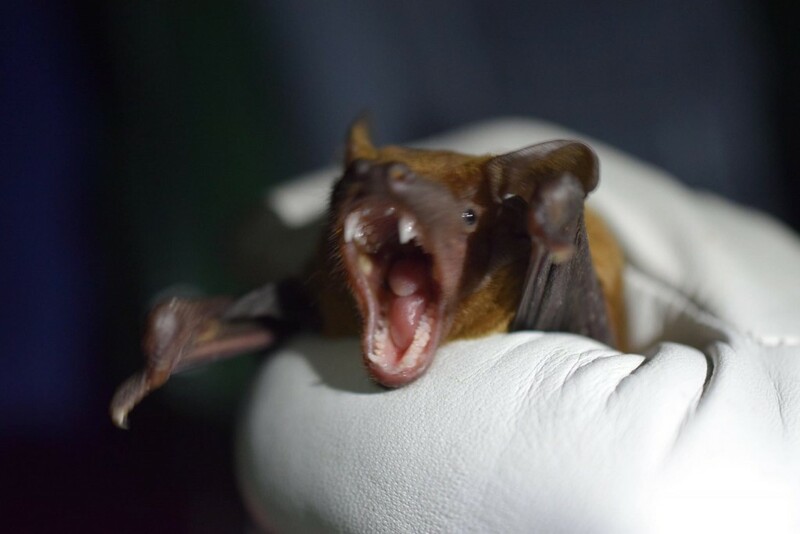 It is good fun working with people from other bat groups. Here’s to more nights this, but pretty please can we have a Nathusius? This entry was posted in Uncategorized and tagged barbastelle, Daubenton's, harp trap and lure, Natterer's bat, noctule, soprano pipisrelle, Swineshnead wood. Bookmark the permalink.